All Wood Cabinets of Vero Beach is your one stop shopping center. We are here to service all of your home remodeling needs. 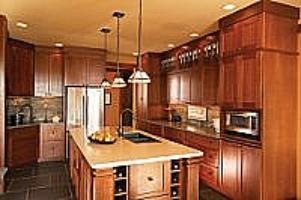 Our company offers a wide variety of solid wood cabinets to fit any budget. We also provide counter tops, flooring, plumbing accessories, windows and doors. Our attention to detail will provide you with the best value and the finest quality. As an up-to-date business, we want to give you the opportunity to stay in touch with our company and our offers. Currently we have a Design Specialist who is here to walk you through your project starting with our free computer graphic design service. We will continue to guide you through the entire selection process to ensure the quality of your project from start to finish. We are a fully licensed and insured company with our own professional inhouse crews for all installation needs. We specialize in complete Kitchen and Bathroom remodeling. Our office currently offers cabinet lines such as Jarlin, LifeArt, Kabinart, CNC Cabinet Components, Bremtown, and more! Our staff and design center is here to make your selection so much easier. We can be reached at 772-569-3309 or e-mail at mark@allwoodvero.com. We are looking forward to hearing from you.